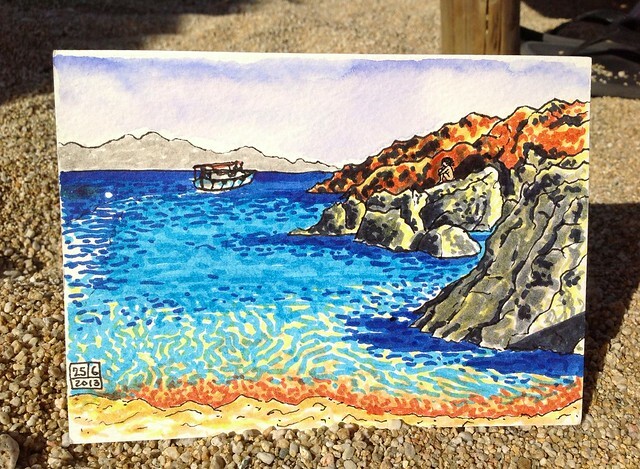 Home » Mykonos » I met a Greek urban sketcher on my last day in Mykonos! I met a Greek urban sketcher on my last day in Mykonos! Iris Giannakopoulou’s card and exhibition invitation. A Greek urban sketcher! Our last night on Mykonos was June 25. We had one more seafood dinner, then walked around the narrow streets until midnight, soaking up the atmosphere. We walked by a gallery that had caught my eye earlier in the week. The large format canvasses I could see from the door had looked suspiciously like giant urban sketches blown up. It was past midnight, but in Mykonos most shops in the tourist areas are open until 12:30 or 1:00 a.m. or even later. The clubs don’t even open until midnight or 1:00 a.m., then the clubbing goes on until sunrise. The artist was there: Iris Giannakopoulou, a Greek architect from Athens showing her urban sketches of travelling on boats around the Greek islands and water ways. She had only discovered the Urban Sketchers organization about a year ago, and had never met another urban sketcher, so she was overjoyed to meet me. I could detect the same excitement in her that I feel about drawing. We showed each other our sketchbooks and talked for a long time. It was another one of those intense connections that can happen with other sketchers. This is why I didn’t get to bed until 2:30 a.m. and we had to get up at 5:00 a.m. to catch an early flight to Athens, then transfer to Frankfurt, which made me a bit of a wreck on our travel day. But what a great way to end my visit to Mykonos. 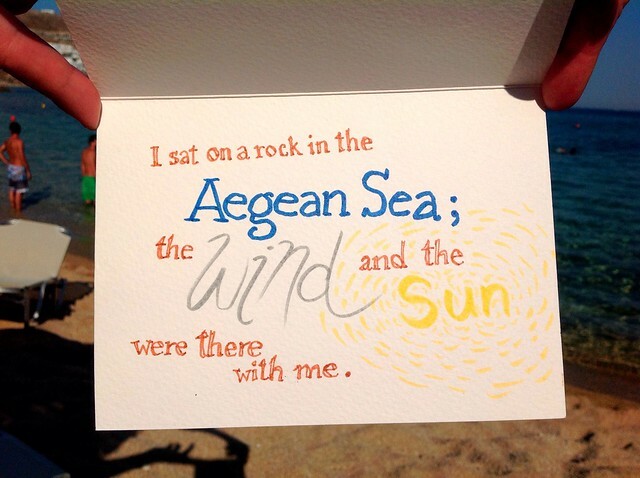 Below is a card I drew and a poem I wrote on my last visit to the beach. Not aspiring to poetic greatness, as you can see, but just trying to describe a wonderful experience. I really enjoyed reading about your Greek travels. Thanks Don! I enjoy keeping up with yours and the Vancouver Sketchers’ adventures too. to cap your trip of Greece. pure bliss! Hi!!!! It was lovely to meet you!!!!! You are right! I was overjoyed and still am! Your sketches are wonderful! Thanks for sharing, and thanks for preferring this than a good sleep before such a long trip! I assure you from my behalf that it was worth it!!! 🙂 I ll follow your travels with great joy and hope to meet again soon!!! !